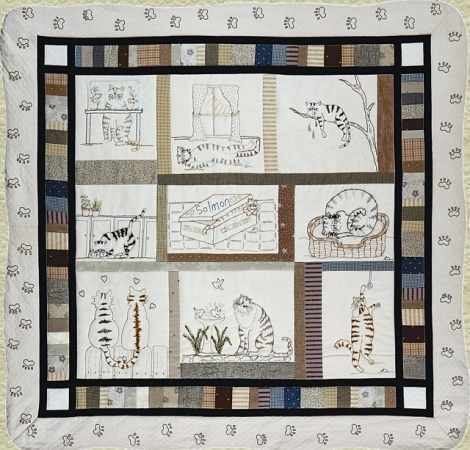 Perfect for the cat lover in your life, this stitchery design features nine blocks of cats doing what cats do best: eating, sleeping & playing. Measuring 43" square, It's A Cat's Life is hand-stitched on muslin, then surrounded by strip & scrap borders that are machine quilted. The final border features all those paw prints stitched fabric & they look much better there than they do on your car! All patterns include a thread chart & use four basic stitches: Backstitch, Running Stitch, French Knot & Lazy Daisy.